Well, this was a surprisingly good wine both, for the money and also for Chile. I'd not tried any wine from this country since the early eighties when I picked up one bottle as part of a mixed tasing case from the wine society. That bottle was all that I ever wanted to know about the wines of Chile but, of course, they have improved a lot. This wine was a pleasant eye opener. Dry, dark, rich and full and no rough edges. This wine has nothing to be ashamed of. Bring me some more please! Maria Rating: I like it very much but it makes my face turn red. 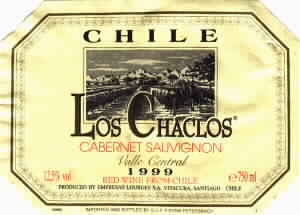 Los Chaclos, Cabernet Sauvignon 1999 DeM3.99 from "Plus" all over Germany.